An antidote to the high street vibe of mainstream San Antonio is this mock-eastern affair. 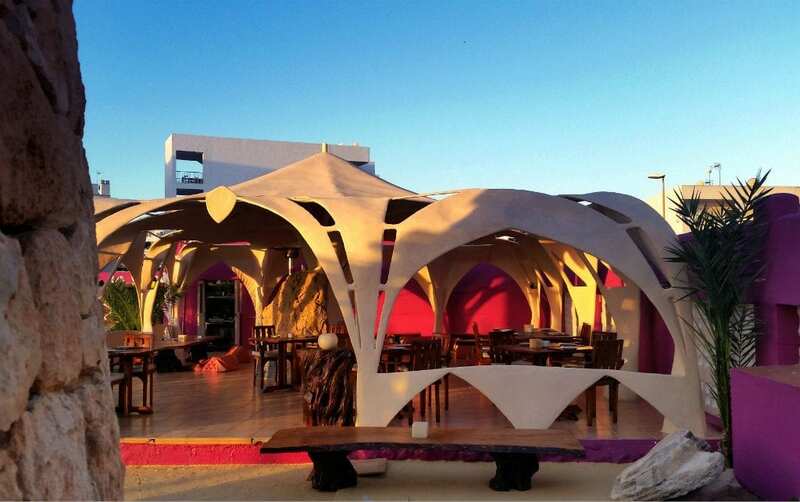 Kumharas is the San Antonio version of the Ibiza cod-hippy vibe that peppers everything on the island. It’s a look, more of a costume than a genuine spiritual feeling, but it fits like a glove and is something you see a lot of in other parts of Ibiza. I think San Antonio is better for it. It needs more Ibiza and less UK. 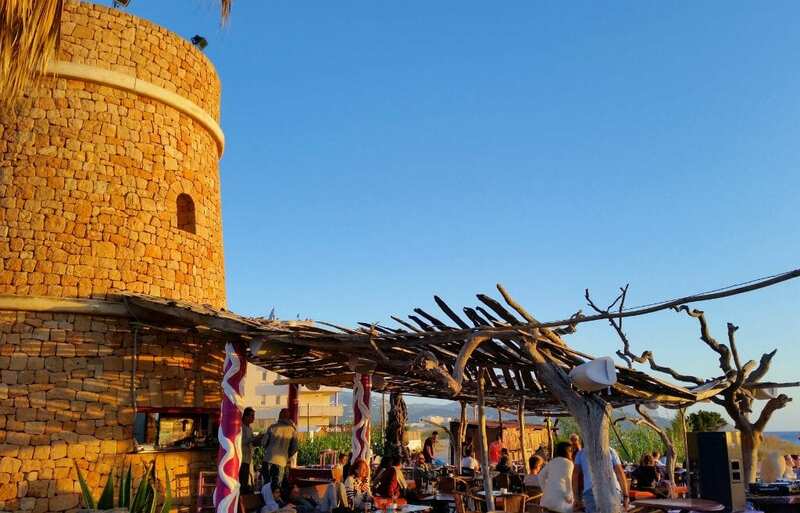 Situated well away from the main part of San Antonio on the southern tip, it’s got a typically rugged Ibiza rocky car park of its own as you pass the tower and entrance. Watch your bottom end, anything but a 4×4 may suffer a crunch. It’s at the end of a street that is unlikely to have any spaces so brave the rocks and pull up outside. Car park on a pleasant beach? Not a bad start. Fire jugglers, DJs and trinket markets are usually my idea of hell, but my apprehension was misplaced. After a warm and genuine greeting from the excellent staff and a (really very wonderful) chilli mango cocktail, Miguel the owner came to say hello. For 20 years he’s been fighting a one-man rearguard action against creeping commercialisation. “This is my house” he explains. And it really shows. I was amazed Miguel seemed to have built into one of the original ancient coastal watchtowers, no idea how he managed that considering Ibiza is a Unesco World Heritage site. Miguel cheerfully explained that the area used to be a crazy golf course! And the tower was converted in the 1930s. All very interesting. As the sun started to set I was amazed to realise DJs were playing and it wasn’t annoying. It wasn’t very busy this early in the season but two DJs playing 80s electro and Balearic madness was actually adding to the place, rather than taking away is it often does. The staff were shocked that I wanted to eat without seeing the sunset. “Seen it” I replied to their amusement. I asked if they had the usual hippy thing of people applauding the sunset. They laughed and said “no, we slap the clappers here”. I heartily approved. I was ushered around the back to the restaurant in a strange space module. Perfectly in keeping with the oddball Star Wars Cantina vibe. 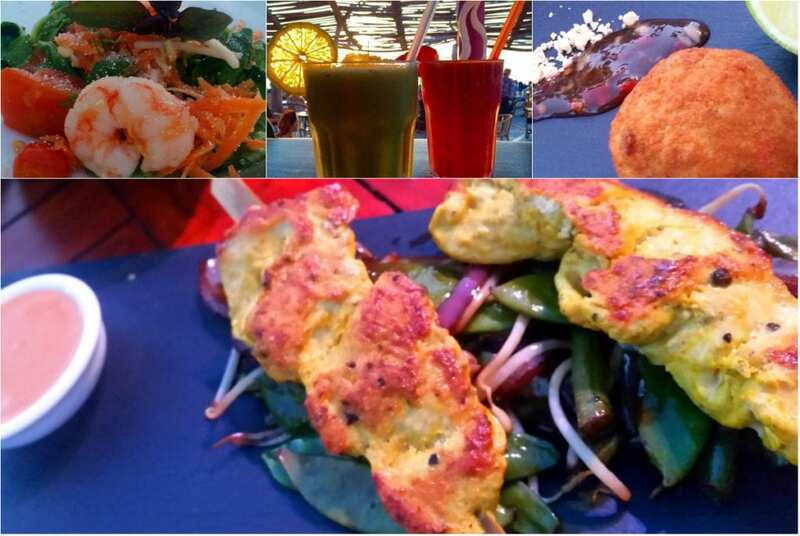 Chef winters in Thailand and other parts of Asia and it shows. As always I asked for a bit of whatever he wanted to impress with. I rather luckily ended up with a small dish of nearly everything they have to offer. It was an impressively authentic take on Asian fusion. Immediately I was taken with a coconut aioli, a jazzy take on the local appetiser. Great opening gambit along with a squid croquette. 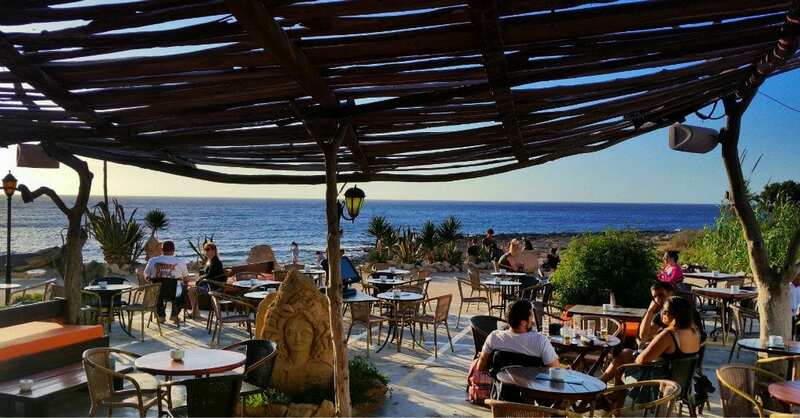 Another Ibiza staple delivered with an Asiatic edge. Prawn Thai Salad up next, a genuine tasting cold entree. But the Tom Yan Goon Soup that followed was a shocker. Perhaps the best I have had outside of Thailand. Deep, complex and delicate. A theme Chef kept up throughout. Not being head-butted by spice but massaged by flavour. Then his Chicken Satay and peanut sauce triumphed. Perfection. A white wine suggested by the house was stuck to, it seemed to resonate with everything. An interesting Cambodian Scallop came next. Again it was complicated and dare I say jazzy? Lots going on there. Then to round it off a couple of standards for the uncomplicated Brits with a note-perfect Lamb Tikka Massala. A taster of the house steak with veg and Japanese black pepper sauce ended the marathon session. If it was appropriate to applaud without getting a slap I would have. My dining companion, usually someone so fussy they hate to eat out, was almost speechless. I heartily recommend Miguel’s house. It’s a warm welcome and underneath all the easy-going is a steely attention to detail and decades of dedication. Kumharas is easily the best place to enjoy the San Antonio sunset, well away from the throng. Get involved. Coming to Ibiza this spring or summer? Interested in great value Ibiza villa rental? Check out our lush Ibiza villa collection, with affordable prices, short-term and weekend breaks welcome. Like us on Facebook or follow us on Twitter / Instagram to be the first to hear about our fantastic special offers.